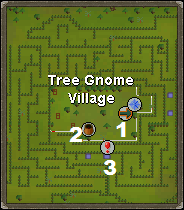 Tree Gnome Village is located between Yanille and Ardougne, to the far west of the map. It's close by to the Fight Arena and Port Khazard (located to the east), as well as the altar to the north west and the Ogre Cities to the south. The Village can also be useful for questers, as it provides an easy teleportation to the Grand Exchange and of the many quests in the area, such as the Tower of Life and the Fight Arena quest. A way to get to the village, especially for newer members, is by walking from either Yanille or Ardougne. Castle Wars is also close by, using the Ring of Duelling, and from there you can walk north east. 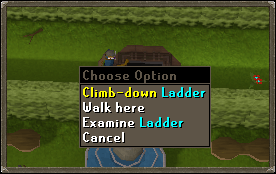 It's not recommended to walk all the way from the central areas of Runescape, Varrock, Camelot, Falador etc. because they are far away. 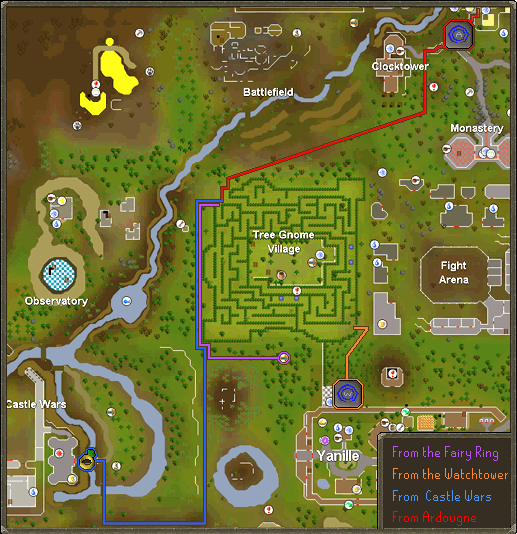 Teleporting to either Yanille, Castle Wars or Ardougne and walking from there is the quickest way if you wish to teleport. The common way of reaching the village is by using the Spirit Tree Teleport. 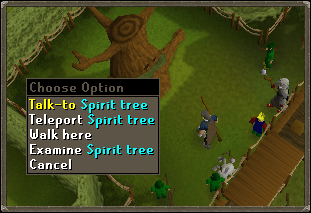 To use this, you must have completed Tree Gnome Village Quest and teleport from either of the other trees around Runescape. 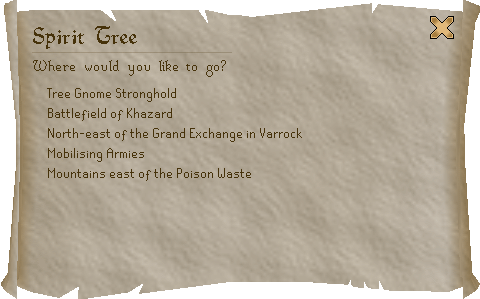 The trees available are in the Battlefield of Khazard, Tree Gnome Stronghold (this is one-way unless The Grand Tree quest has been completed), The Grand Exchange and the Canyons east of the Poison Wastes (requires The Path of Glouphrie Quest). These will teleport you directly to the center. If you have the correct farming level, you can also plant a Spirit Tree right by the entrance and then once it has grown, travel straight there as you would any of the other trees. 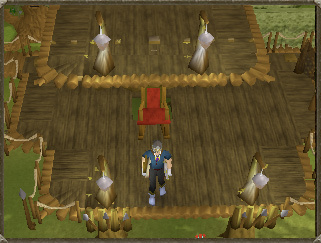 Tip: A very easy way of reaching the village is by using the Amulet of Glory to teleport to Edgeville or teleport to Varrock, and then running to the Spirit Tree in the north east section of the Grand Exchange. 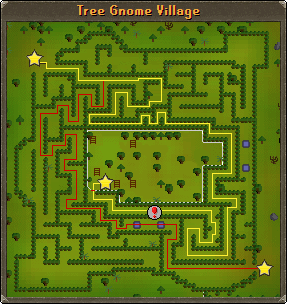 Unless you teleported directly into the Village using the Spirit Trees, you will first have to make your way through a simple maze to the center. 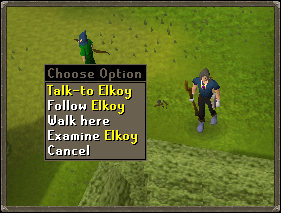 However, once you have done the Tree Gnome Village Quest, there is a gnome, Elkoy, at the north west entrance who will take you there directly. There are also several Giants, Wolves, Goblins, Moss Giants, Rats, and Ogres of various levels throughout the maze, be careful around them, as they're aggressive! To make your way through the maze, go to either start point to the north west or south east of the maze. This map will help guide you through, take the red path from the south east, and the yellow from the north west. But remember - monsters litter the paths to the center. Once you're at the end, you'll have to squeeze through the fence to enter. Elkoy will only appear at the north west entrance. Other than talking to the local gnomes, there are three main attractions to the village, as well as some nice spots to visit. This is the most used feature of the village. Talk to the tree and it give you options to a variety of places, dependent on which quests you have completed. You may wish to talk to the King by the Spirit Tree to start the Tree Gnome Village Quest or The Path of Glouphrie Quest, or visit his Throne Room on the second level. There is only one shop in the village, Bolkoy's General Store. It's located on the second level, so to get up there you must first climb one of the ladders. Bolkoy is also used during a clue scroll. He'll ask you a question before giving you the next clue. He will ask how many flowers there are under his hut, the answer is 13. The Dungeon is located just east of the bars you must squeeze through to get to the inner part of the maze. It's main use is during the Waterfall Quest. To enter the dungeon, climb down the ladder. The dungeon is not incredibly large, yet contains several Hobgoblins (level 28), Zombies (level 13) and Bats (level 6). Depending on which Quests you have completed or started, the NPCs around the Village will react differently when spoken to. They will mostly hail you as a hero once the majority of the Gnome Quests are complete.